The Kebbi State University of Science and Technology, Aliero [KSUSTA] Turns Eleven  Years Without a Single Convocation Ceremony for her Graduates. 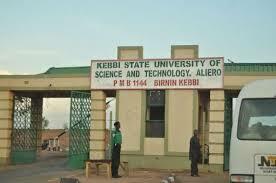 Its no news that the Kebbi State University of Science and Technology, Aliero is currently plagued with the strike action of the Academic Staff Union ASUU due to un-implementation of ASUU demand from state government. This has really brought or impose a major setbacks which hinders the development of the school to it's national standard and a slap to students face. The convocation is One of the major reason for strike. The Kebbi State University is among the best university of technology in Nigeria as at 2016 that produces the intellectual graduate in both academics skills and practical. I have never regret going to KSUSTA and I'm proud to called myself a graduate of KSUSTA. believe me, you can't challenge KSUSTA graduate in his field of study. In some interview conducted in One of the polytechnic in state KSUSTA graduate never failed his questions, an officers even pointed me that I should stop answering question again it's enough, KSUSTA graduate maintained the status quo even admist of their graduates counterparts. Unfortunately!!! today KSUSTA is eleven years without convocation, When UMYU and Taraba state universities that were established the same time has passed the level, two of this university conducted the convocation just yesterday, so what is wrong with the our best university of technology in Nigeria? who is to blame? the leaders of the state I would like to use this medium to called the attention of the state Government and all stakeholders to intervene this issues of our only best university. remember, build the build the nation, but you can't do that without standard devotion in education. Thank you and God bless Kebbi state and Nigeria as whole.